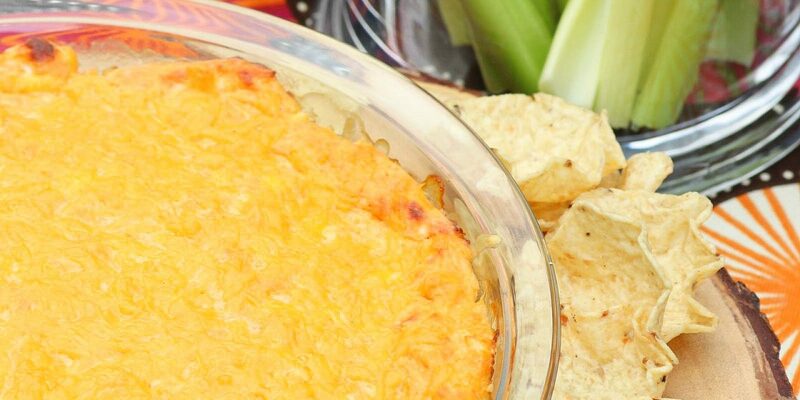 Hot Buffalo Chicken Dip is a quick and easy appetizer that is sure to be a hit at your next party! Made with slow cooked buffalo chicken, cheese and loaded with your favorite wing sauce, it’s a hot dish that will have everyone begging you for the recipe. 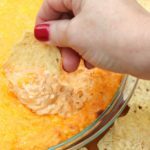 I’ve taken my Slow Cooker Buffalo Chicken recipe and turned it into a second recipe…dip! 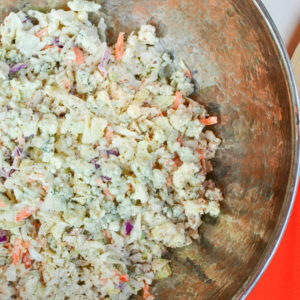 I love using a recipe in more than one way and this one is a perfect fit for such a lofty goal. 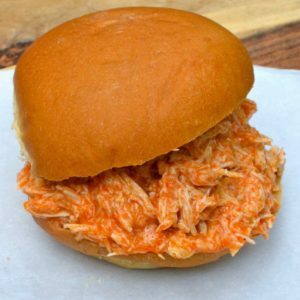 Several years ago, I created my version of buffalo chicken, cooked low and slow in the crock pot. It’s a winner! I make it when I’m feeding a crowd, when I’m entertaining and when I need a no-stress weeknight meal. After making it a few weeks ago, I had some leftovers, so, I decided to turn it into dip. The recipe came together in no time since I had all the necessary ingredients right in the fridge. I mixed my leftover chicken with some cream cheese, cheddar and sour cream. I added a bit more wing sauce, topped every off with more cheese and baked the dish for about 30 minutes. The outcome was awesome! I served the hot dip with cool, celery sticks, since they are the sort of required when you’re eating buffalo anything. I also served some tortilla chips that were ideal for scooping up big helpings of the creamy dip. 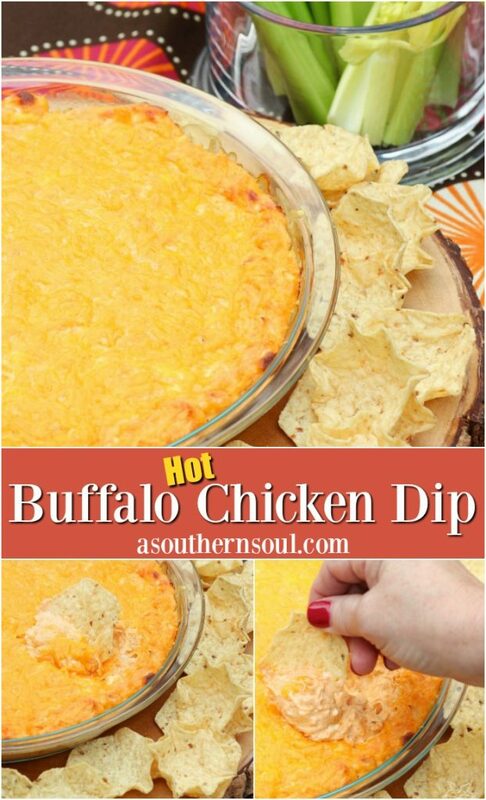 I’ll be making this dip again this weekend while we hang out to watch the football playoffs. 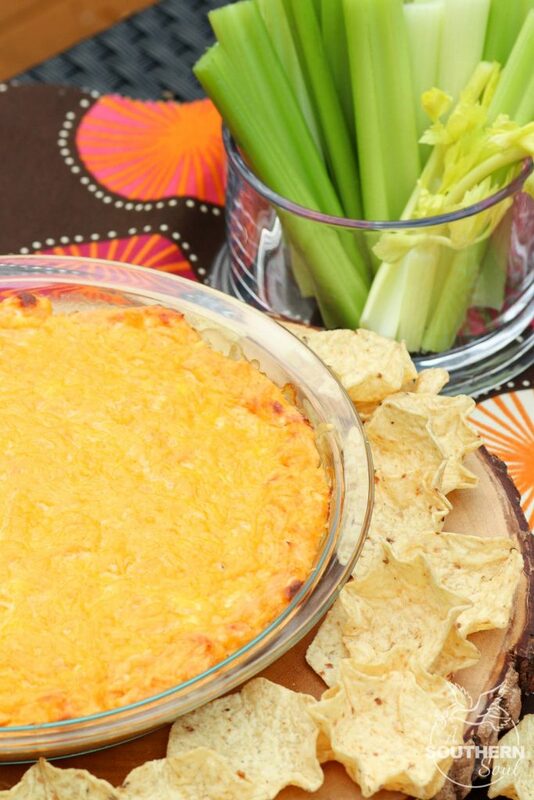 I know one thing for sure, I’ll be the one scoring points when I serve this Buffalo Chicken Dip! Heat oven to 350 degrees. 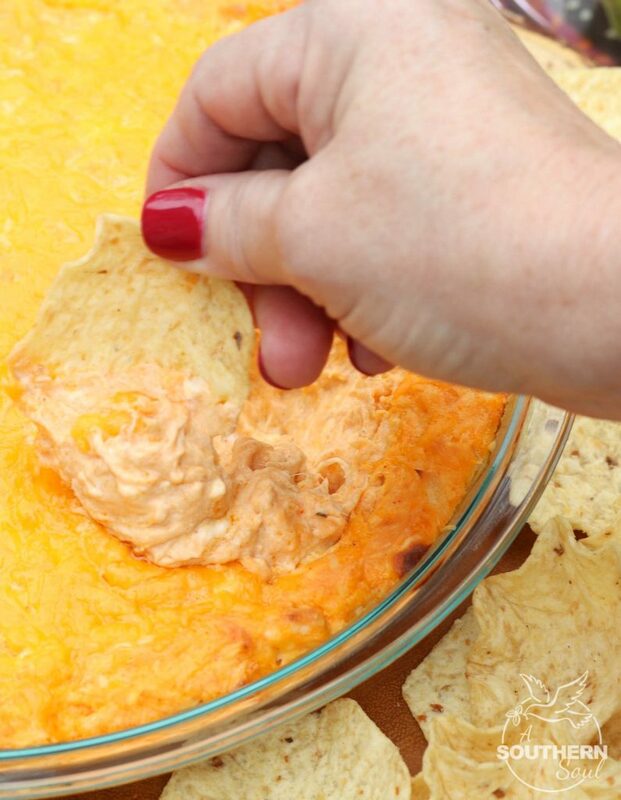 In a large mixing bowl, mix buffalo chicken, cream cheese, sour cream and 1 cup of cheddar cheese. Add additional wing or hot sauce if desired. Pour into a glass or oven proof baking dish and top with remaining cup of cheddar cheese. Place in oven and cook for 20 - 25 minutes until cheese is golden brown and bubbly. Remove from oven and serve with celery sticks and/or tortilla chips. 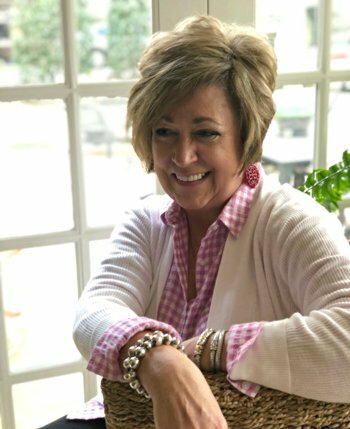 Follow A Southern Soul on Pinterest for more great recipes and cooking inspiration! What do you do with the other cup of chedder cheese? Have mercy! I am so sorry Mary. Thank you for your question. 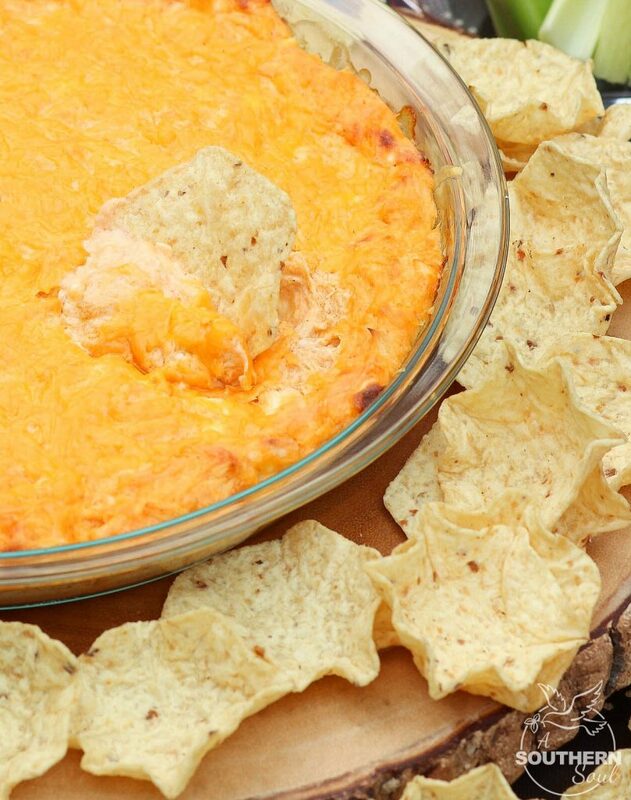 Place the remaining cup of cheese over the top of the dip. I have update the recipe card as well.